Create a unique style with a pair of personalised sunglasses. A fashionable style, our shades are made from a strong, shatterproof plastic, which will look fresh all year long. Make your own sunglasses and create a pair of bespoke designer sunglasses. We print your design onto all four frame areas of these trendy sunnies and then assemble them by hand. Whatever the season, whatever the weather, look cool in unique funky sunglasses. It doesn't get cooler than Personalised Sunglasses. These designer sunglasses are made from a durable, shatterproof plastic and are fashioned on the classic sunglasses style. The universal and unisex style means they look great on everyone. Customised sunglasses have a matte finish and offer 100% UVA and UVB protection. The high-quality print is perfect for making your designs pop. These sunnies are also strong, having passed the drop-ball test, your personalised shades look fab, and hold their own when it comes to knocks and drops. Quality and service absolutely spot on, I was very happy with the speed of delivery as well! Excellent, all the way from checking image quality through to delivery. Speedy service and a great unique gift. I can't wait to give the sunglasses to my dad on Christmas Day! What Will My Printed Sunglasses Look Like? We use specialised 3D printing technology, to ensure all parts of your Personalised Sunglasses are printed to perfection. Because we are able to infuse the print into the plastic of the sunglasses, it means that they are fade resistant, and your print won't peel, scratch or rub away. Please note, due to our specialist printing methods, darker colours might be slightly stretched because of the hand-pressing print process. This means that dark colours might appear slightly desaturated on edges and corners. Forget just printing on the arm - at Bags of Love, we print all over the sunglasses frame. There are four print areas; the front, the back and both arms. This gives you total control over how you want your printed sunglasses to look. Your sunglasses are assembled by hand by our skilled team of technicians, to ensure a flawless finish. 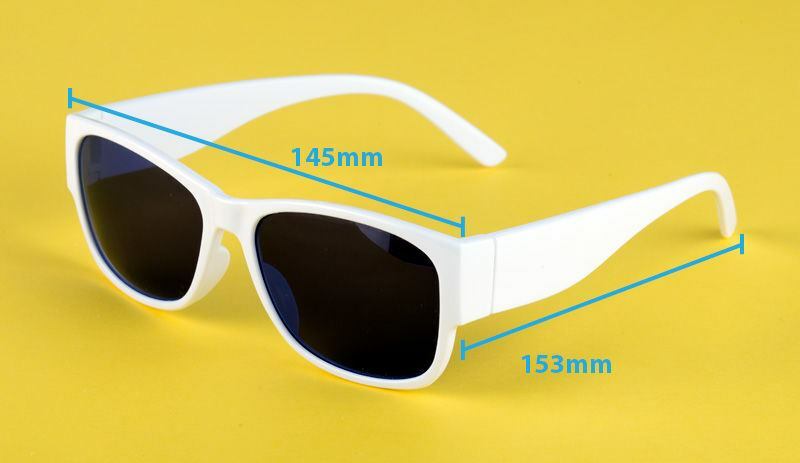 The dimensions of the Personalised Sunglasses are 14.5cm width x 5cm high with an arm length of 15cm. The best thing about a pair of stylish sunglasses is that they can be worn anywhere, for any occasion at any time of the year. Don't just save them for summer; create a pair of your own branded sunglasses, which you can rock every day. Our Personalised Sunglasses suit men and women, so they make great personalised gift ideas. Why not make an impact on your wedding photos by designing a pair of wedding sunglasses, with a photo of your new husband? How cool would that look in the wedding album? You could even create a matching pair for the groom with your photo. They would make a great keepsake wedding gift for your special guests too. Are you a brand, looking to launch your own line of designer sunglasses? These shades are great for getting you noticed. Thanks to the fashionable style, these coveted sunglasses will make a lasting impression. All that is missing is your design. Why buy expensive designer sunglasses, when you can make your own? The problem with some sunglasses is that you might never be able to find a pair to perfectly suit your style and personality. When you design your own sunglasses, you can make them look however you want. From photos and text to original artwork and colour blocking, you are the designer so you are in charge. You can complete your sunglasses with a matching Personalised Glasses Case. Your rigid custom glasses case can be designed to feature the same print as your hot new sunglasses. You even have the option of designing a matching cleaning cloth. We incorporate four printable areas on your personalised sunglasses, which means that every part of the shades will be covered in your design. Thanks to our specialised printing techniques, we are able to print each individual piece of the glasses, before assembling them by hand to bring you the final, polished result. Please note, as we press every pair of sunglasses by hand, the alignment might vary +/- 1-3mm. We therefore always suggest using a repeat pattern, where alignment does not matter so much. This will ensure your sunglasses look stylish, unique and individual just for you. You have four frame areas to design on your customised glasses and there are a few things you can do to ensure maximum impact with the highest quality designs. Go for something, which will truly make your shades standout - after all, if you are designing your own sunglasses, you want to make sure that they look different to any other pair in the shops. It is important to remember that the printable areas are relatively small, so we recommend patterns but using a single photo on the arms can be okay, to ensure that no important details are lost. Please be aware that the design you create for the front of the glasses, will be interrupted by the unprinted UV protected lenses, so make sure you incorporate that into your design. A bold, punchy print really makes these cool sunglasses look fabulous. For best results, we suggest using a montage of pictures or patterns as opposed to solid colours as in some cases. 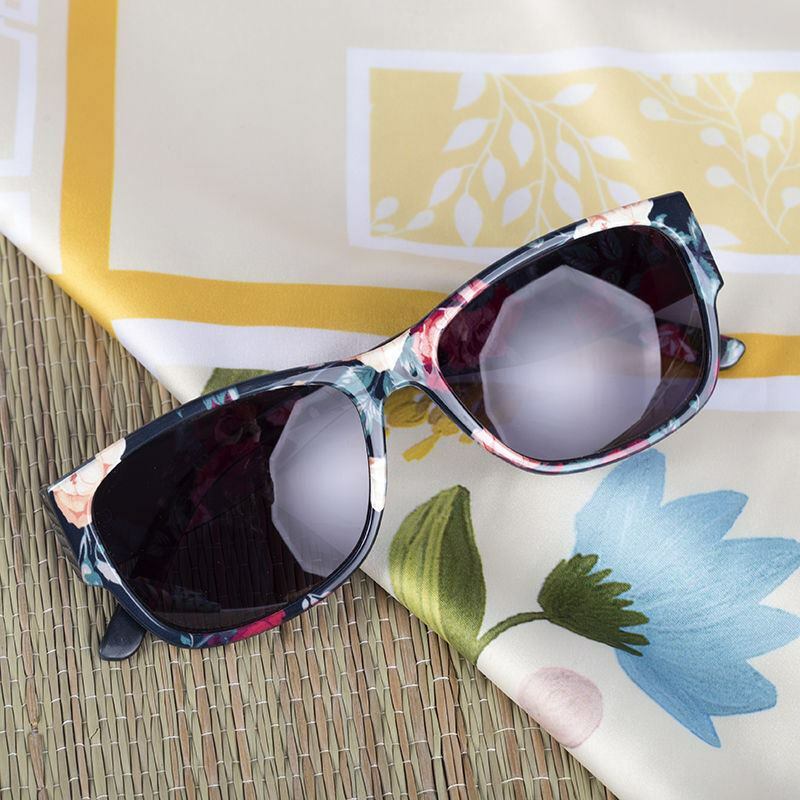 Due to the curvy edges of the sunglasses, the print might be less intense around the edges. This will be obvious if you go for dark colours but not as evident if you use a montage or patterns. This personalised hard shell glasses case not only helps them to keep track of their glasses, but protects them too.